With four quads, there was no shortage of action at this week’s Saturday Quads. Despite entering the tournament ranked third, NM Oliver Chernin dominating the top quad winning all three games! 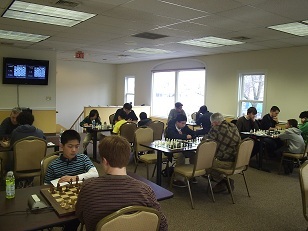 In the second quad, top seeded Hanon Russell was upset in the first round when he lost to Eric Zhang. Russell recovered, winning his next two games to tie for first with Brian Arpie. Another crushing performance was put in by Leo Bykhkovsky who won the third quad with a perfect 3/3! The fourth quad was very close. Favorite Kurt Rubin lost in round two to Brandon Wang, but beat the tournament leader Max Lu in the final round to catch him and tie for first! Don’t miss the fun next week when we will have another G/45 quads.